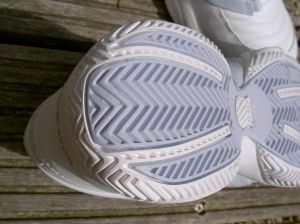 Buying tennis shoes that have specially designed lacing systems for enhanced lateral support is a good idea. 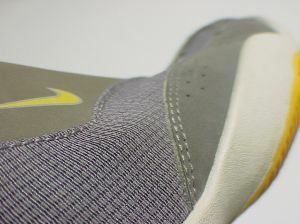 Also, broad outsoles and sturdy uppers are highly desirable, particularly if you've got a large build. If you've got weak ankles, but don't like wearing ankle braces, consider wearing hi-tops. The major consideration here is court surface. For hardcourts, the traditional herringbone pattern is the best. For grasscourts, see if you can get tennis shoes with the small rubber studs that will prevent you from slipping. For indoor carpet, you'll need completely smooth soles so that your feet don't "grab", which causes excess stress on the ankles and knees. For clay, get recommended clay court shoes, which allow you to slide effectively. If you use excessive toe drag on your serve, look for shoes with heavy exterior protection in the toe area. Also, make sure that the area under the ball of the foot, which is where most pressure is exerted, is well padded. Don't be tempted to buy a non-tennis shoe, no matter how appealing they look. You won't get the right support or grip, and chances are you'll end up hurting yourself. If you want to check out a brand that is perfect for you, I've put together a web page that provides all the information you'll ever need for buying tennis shoes at the cheapest prices, online or offline. Click buying tennis shoes for men or buying tennis shoes for women for the best range of tennis shoes at the best prices on the net. You might also like to read what I've got to say about the best shoe that I've ever worn by clicking here.